The calendars on this page are the type that one uses to organize their day or to record some details about their day. While most of the calendars fit well in an ordinary binder, a few are designed to be pinned to a corkboard or hung on a wall. The Block Calender is simply pages of dated blocks for each month. Calendar SW utilizes the margins for Saturday and Sunday in order to increase the width of the blocks for Monday through Friday. 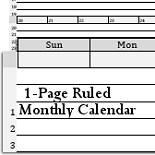 A ruled space is included at the bottom of each month. 2-Page Block Calendar prints in portrait mode. The blocks for each month contain the dates and are large. Last month and next month are represented in the form of tiny calendars on each month. Ruled Monthly Calendar is a bit odd in that the dates for each week run both across the page and down the page. Each file prints an entire year. Clean Notebook Calendar is a no frills monthly block calendar that prints in landscape orientation. BIG Cal is DY's largest calendar. Each month prints on 4 sheets of paper. Assembly, cutting and gluing, is required. The finished calendar is approximately 21" x 16" and fits nicely on a 24" wide cork board. D.C. Journal is a lined calendar that prints 6 pages for each month. Each page includes the current month's dates in the inner margins. File requires subscription to print. Wall includes calendars with big numbers that one could possibly read from a few feet away, no guarantees though.